The Founding Team of Mobisy | Photo Credit: Photo Courtesy: Mobisy Technologies Pvt. Ltd.
Bangalore-based Mobisy Technologies Pvt. 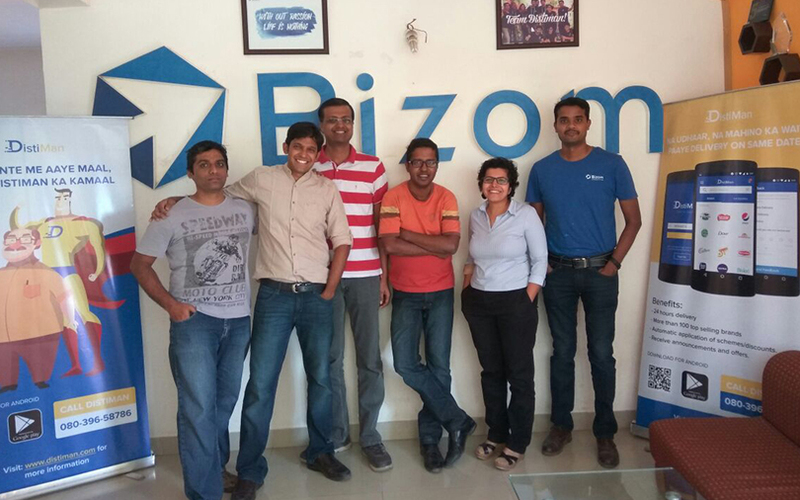 Ltd, which operates supply chain automation platform Bizom and mobile marketplace app Distiman, has raised $382,000 (Rs 2.5 crore) in a bridge round from existing investor Ojas Ventures and two undisclosed angel investors. Arun Narayanan, co-founder, Mobisy Technologies, confirmed the funding round, and told VCCircle that the capital will be used to expand Distiman geographically and scale up Bizom’s operations. “Other functions, such as brand sales and engineering, are shared. In fact, Bizom is Distiman's back-end technology, so the engineering roadmap for the products is essentially the same. Hence, the same resourcing and costs,” Narayanan said. The company is also in talks to close a $5-million (Rs 33 crore) Series A round, the funds from which will primarily be used to expand Distiman’s operations. “We are in fairly advanced talks with several investors, whose identities we cannot disclose. Our existing investors are also looking to participate in the round,” Narayanan said, without elaborating on the timeline. In 2013, Mobisy Technologies had secured $300,000 in seed funding from Ojas Ventures. Launched in 2007 by Lalit Bhise, Mobisy Technologies started with a product called Mobitop, a versatile platform for mobile app development. In 2009, the company decided to pivot to mobility enterprise solutions catering to the FMCG space. Vasudeva Manjunath, Shree Kulkarni and Arun Narayanan joined as the company’s co-founders at a later stage. Bizom, launched in 2013, is a mobile-first platform for retail channels and teams to transact, collaborate and accelerate. It helps FMCG brands and their feet-on-the-street sales team digitise and render in real time order and inventory management, enabling better planning, setting targets and tracking field salesmen activity. The HR automation tool offers features like attendance leave management and employee claims management. Bizom, which is currently used by over 180 customers including Nivea, Parle Agro, Hersheys, Mars, ID Fresh Food India Pvt. Ltd and Cargill, plans to launch in Africa and South Asia. Launched in 2015, Distiman acts a virtual distributor for FMCG brands. It acts as a parallel channel even as retailers continue to source inventory through the traditional method. The mom-and-pop store owner, the end-user of the app, can order products based on his inventory status. The app empowers some of its retailers as sub-stockists, who act as a distributor to other stores in the locality. The go-to market strategy of Distiman involves identifying markets where brands have distribution gaps. Currently operational in parts of Mumbai and Mysore, Distiman recently expanded into Kolhapur and is setting up operations in Hubli (Karnataka) as well. It had on-boarded 3,000 retailers by June last year. “We currently talk about weekly active retailers (retailers who use the app to order on a weekly basis) instead of the total retailer base, and that number is about 1,500 right now,” said Narayanan. Distiman makes margins from both FMCG brands as well sub-stockists. Currently, products from over 180 brands are available on the platform. According to Narayanan, Mobisy is on track to make $2 million in revenue this year. He claims that the company is already profitable, and has been seeing 370% year-on-year growth. While Bizom has been its major money-spinner until now, Mobisy expects Distiman to contribute as much as Bizom down the line. “As a scaling opportunity, Distiman has immense potential to generate revenues, considering the $500-billion retail market in which it operates,” he said. As a software-as-a-service product for retail tech, Mobisy competes with the likes of Mumbai-based Just Buy Live, Indore-based ShopKirana and Bangalore-based Shotang. On the sales force automation side of things, it competes with the likes of Banglore-based Vymo.